The Belt and Road Forum for International Cooperation will be held from May 14 to 15 in Beijing. About 29 heads of state and government will participate, as well as over 70 leaders of international organizations, 100 ministerial-level officials from around the world and 1,200 other delegates from various countries and regions. 12 projects have been approved by AIIB with 11 more proposed, covering energy, transport and infrastructure. The action plan for the Belt and Road initiatives, released on March 28 during the 2015 Boao Forum for Asia, is expected to change the world’s political and economic landscape through the development of countries along their routes, most of which are eager for new growth. A Chinese train maker signed a deal on Tuesday to sell 22 electric multiple units (EMUs) to Malaysia, which will be delivered by the end of 2018. 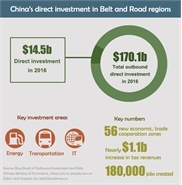 China’s direct investment in Belt and Road regions reached $14.5b in 2016, or 8.5% of total direct investment for that year. China has paid $1.07 billion in taxes ($570 million in 2016) and created 177,000 jobs in B&R countries. 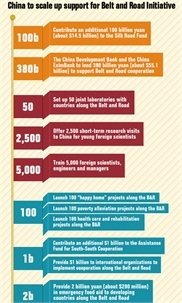 China is currently building 56 cooperation areas in 20 countries along the Belt and Road initiative. In January of this year, residents of Northwest China's Xinjiang Uyghur Autonomous Region were able to enjoy their first ever taste of seafood imported from Pakistan by container trucks through the Khunjerab Pass. 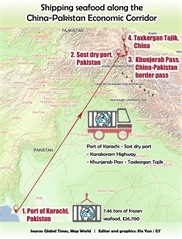 The successful trial is expected to improve overland trade between China and Pakistan via the China-Pakistan Economic Corridor, ,which currently accounts for 2 percent of the overall trade between the two countries. 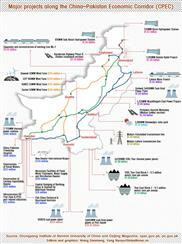 A recently released joint report from the Chongyang Institute of Renmin University of China and Caijing Magazine shows several multi-billion-dollar projects along the China-Pakistan Economic Corridor (CPEC).